Dave Brinker was introduced to northern saw-whet owls in 1975 when he began learning the science and art of bird banding from Tom Erdman at the Little Suamico Ornithological Station, a raptor migration observation and banding station near Green Bay, Wisconsin. 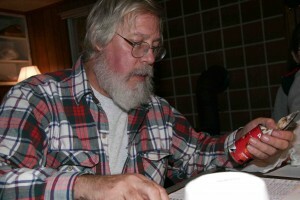 Dave obtained a bird banding subpermit in 1979 so that he could conduct independent studies in northeastern Wisconsin and has been actively banding raptors and waterbirds ever since. In 1986, Dave established the first bird banding station in Maryland to focus on migrant owls at Finzel Swamp near Frostburg, in the mountains of western Maryland. Dave transferred his owl banding effort to Assateague Island in 1991 and has banded autumn migrant owls there every year since. Brinker’s northern saw-whet owl banding efforts grew into five stations spread across Maryland and West Virginia. In 1994, the connections between the Cape May owl banding project, Midwestern owl banding stations and the small Maryland-West Virginia network gave rise to the concept of Project Owlnet. Collectively, Dave and his subpemittees in Maryland and West Virginia have banded over 7,500 saw-whet owls. The efforts of the Maryland-West Virginia group have produced nearly 400 encounters of banded northern saw-whet owls. Brinker works for the Maryland Department of Natural Resources as a regional ecologist with the Wildlife and Heritage Service’s Natural Heritage Program, where he has worked on biodiversity conservation for over 20 years. Dave’s work with Maryland DNR also focuses on colonial nesting waterbirds and marshbirds. Brinker, colleagues from DNR, and many volunteers have banded more than 23,000 brown pelicans since they first nested in Maryland in 1987. During the spring, Dave spends his free time studying nesting northern goshawks in the central Appalachian Mountains from northwest Pennsylvania to central West Virginia. Dave has published, or assisted as a coauthor, on scientific publications about northern saw-whet owls, northern goshawks, red-tailed hawks, broad-winged hawks, marshbirds (rails), soras, American oystercatchers, royal terns and colonial nesting waterbirds. Dave authored numerous accounts for both the first and the second Maryland Breeding Bird Atlases. Brinker is a member of a variety of professional and scientific societies that focus on birds and their conservation.